TELiBrahma (TIB), the mobile advertising solutions company, has partnered with Times Internet Limited (TIL) a Times Group company and a leader in the Mobile-Internet convergence space to deliver near-LIVE IPL video clips on consumers’ mobiles. The near live video clips from the matches are available on Buzz which is a consumer engagement platform developed by TIB and deployed at TIB’s partner locations including Cafe Coffee Day, Crosswords, Nirulas, Spencers, Barista, transit lounges, leading malls and various Railway stations. Now you can seamlessly enjoy the new season of IPL at any of the Buzz locations. Cricket lovers visiting Buzz locations just have to turn on their Wi-Fi or Bluetooth on their mobile devices to experience the IPL excitement free of charge. The best part about this service is that people will be able to enjoy near live streaming of ipl matches with a delay of just 5 minutes. 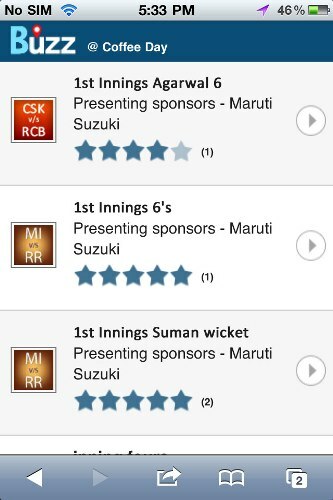 Buzz also has an app which you can use to stream the IPL videos when you are in of the Buzz locations.